Hello there! If you are reading this then you are interested in getting expert nutrition advise to help with your symptoms. This may be the first or last page your read before deciding what the best route for you is. BUT, there are so many people working in nutrition, who do you go to? A dietitian, you go to a dietitian! Why though? Let me explain just how unique a dietitian is. In order to legally call yourself a ‘Dietitian’, you must have a 3-4 year BSc Hons degree (or equivalent in Dietetics) and be registered with the Health and Care Professions Council. This is a governing body which regulates how we work to ensure we are always providing the best, safest service for clients. To be a Nutritionist, Nutritional Therapist or Health Advisor you do not need any qualifications and no one is keeping an eye on what you are doing. Yes, some of these people will have qualifications, but as the qualification are not regulated then there is no guarantee that they are of any worth, in some cases, the qualification has no actual scientific base at all. 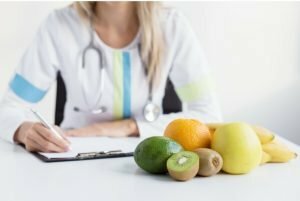 What Can A Dietitian Do That Is Unique? They are trained in medications as part of their degree, this will avoid any nasty interactions when you change your diet. They may also suggest medication changes to your GP if you are not tolerating them. They are legally bound to only advise the best nutritional products for your health. This means that any recommendations they provide are done so on the basis of scientific research, rather than making a profit (note any product reviews on my site also give equal alternatives). They are medically trained. This means that they will have a deep understanding of your medical conditions and how diet can improve that condition. They work alongside your doctor / consultant / surgeon. Unlike others working in the nutrition industry, our medical backgrounds mean that we can advise your doctor (and be taken seriously!). They can help to get a medical diagnosis. Us dietitians know which tests will provide an accurate diagnosis for nutrition related diseases and can work alongside your GP to get these done as quickly as possible. They know how to read scientific studies. Just being able to read the title of a scientific paper is useless. Dietitians are trained to read scientific information in a way which means they can then decide if it is useful for their clients. Not all science is at a stage which is safe or useful to use in humans. If you would like expert nutrition advice, then only ever see a dietitian. Otherwise, you can not guarantee if the advise you get will be of any use, it may even be unsafe. To book a specialist dietitian consultation today, please contact me.